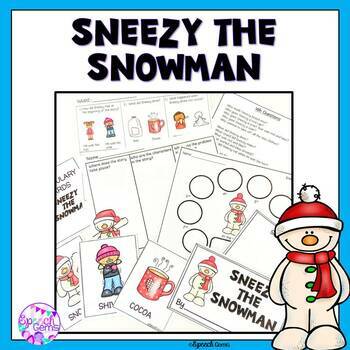 Improve your students language skills using the book Sneezy The Snowman during the Winter or at Christmas time. 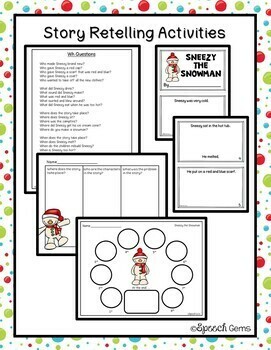 It includes vocabulary cards, a mini book, story characters for retelling activities, story element worksheets, comprehension questions and suggested articulation words. 1.) 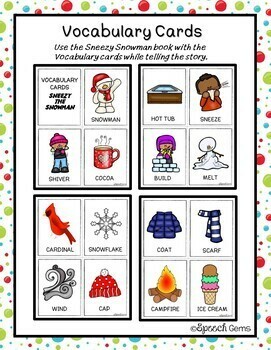 Will correctly label 9/10 vocabulary words from the story. 2.) Will correctly use 5/6 regular past tense verbs from the story. 3.) Will correctly use 5/6 irregular past tense verbs. 4.) 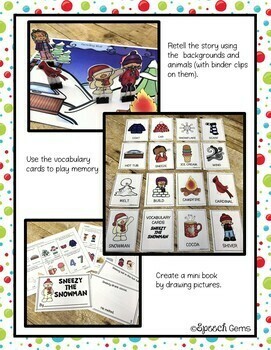 Will correctly answer 10/12 comprehension questions related to the story, when visual choices are provided. 5.) Will correctly answer 8/10 “wh” questions while listening to the story.